Universally, Children's day is celebrated on 20th November to create awareness and encourage the welfare of children in order to ensure a better future. However this date varies in India and it is preponed to 14th November which coincides with the birthday of Pandit Jawaharlal Nehru, to commemorate his great love for children. Pandit Nehru emphasized on welfare of the children and worked towards it. He was fond of children and thus became popular as Chacha Nehru [Uncle Nehru] among them. Kids are eager and look forward to celebrate this day with lot of fun activities and party organized in their schools. At home, I thought to prepare something sweet that they love which means something with chocolate. 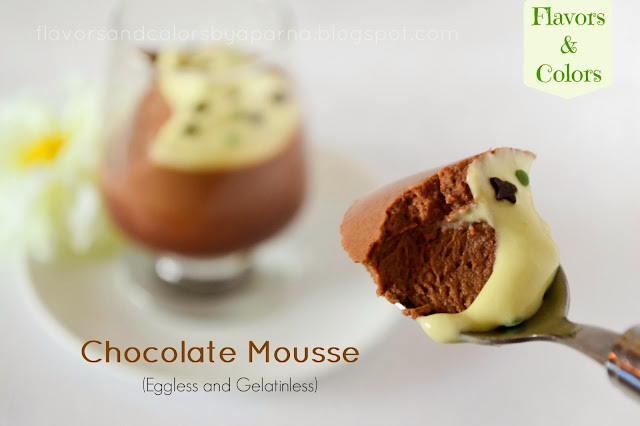 Since long time, I have been thinking of preparing a mousse. Mousse is a French dessert prepared with different techniques. I opted to prepare it without eggs and gelatin and narrowed down to its recipe from Rak's Kitchen. Soak agar agar in water [as per packet instruction, I kept it for 10-15 minutes and allowed it to dissolve completely]. 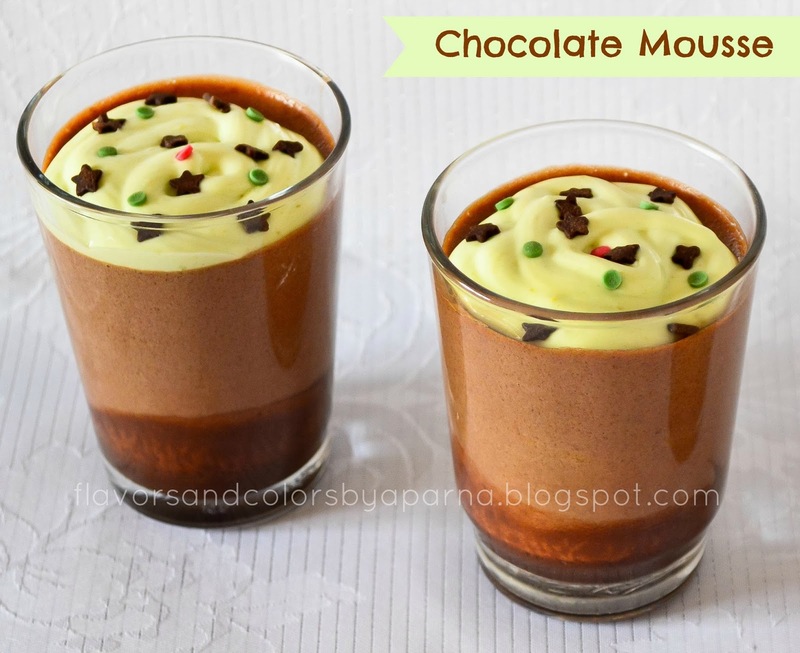 Mix cocoa powder, corn flour well with 1/4 cup of lukewarm milk. Boil rest of the milk with sugar. Once the milk starts boiling, simmer the flame. Add the cocoa powder, cornflour mixture and choco chips to it and keep stirring continuously. Now add the agar agar solution to the milk chocolate mixture [as per packet instruction] and mix well. Cook it for 2 minutes stirring non stop and then switch off the flame. Stir it continuously until it cools down completely. Add orange zest. Whip the cream till you get soft peaks. Take 3/4th amount of it and fold gently into the above mixture. Pour the mixture into bowl or individual serving glass/ramekins that you will serve [I poured chocolate sauce in the serving glasses before pouring the mixture, that's why you can see layers]. Keep them aside to set either at room temperature itself [again as per the packet instruction] or you can refrigerate them. Take the remaining amount of whipped cream, add 2 -3 tbsp avocado puree, 2 tbsp powdered sugar and mix it well. Now pipe it over the set mousse and garnish with some sprinkles before serving. You can top it as per your choice, either dusting with cocoa powder or sprinkles or chocolate sauce. 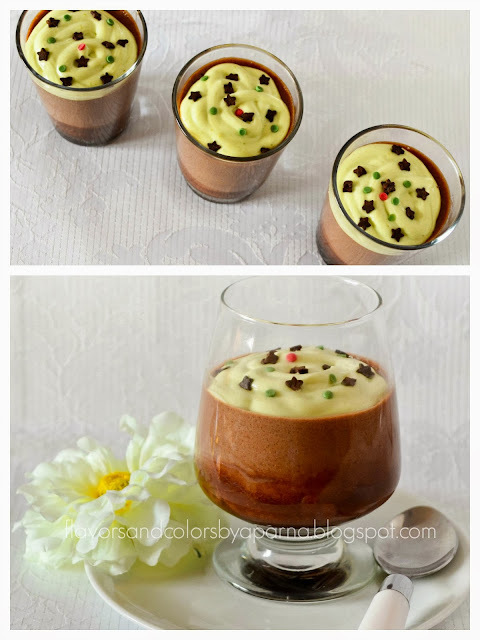 When kids peeped into the fridge to see their favourite chocolate dessert resting inside, they had a wide smile and twinkle in their eyes,,, trying to hint me they are all eager to taste it. To see their sparkling faces and smiles was like a big reward for me . 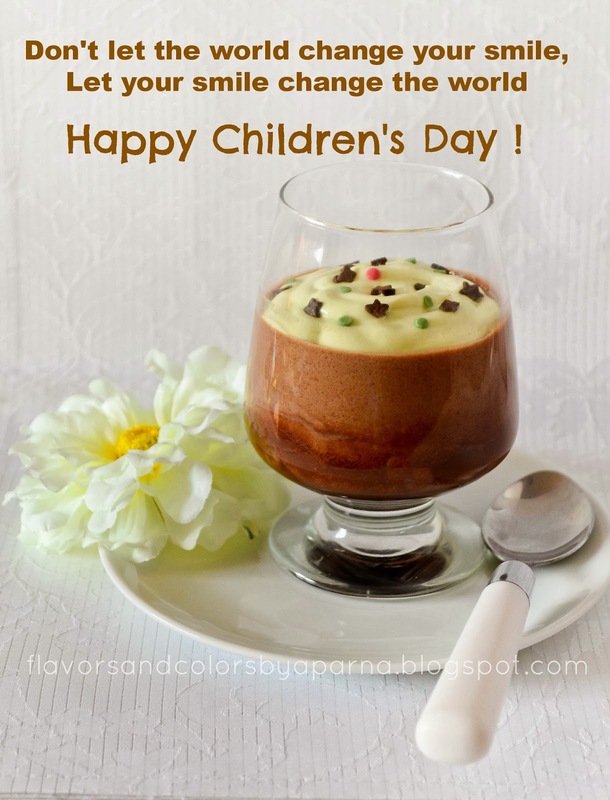 With this sweet treat I wish all of you "Happy Children's Day!". May God bless all kids with lots love, happiness and good health ! Lovely.The colours the presentation ,everything.I love your blog.I have never taste Avocado somehow,but I am definitely going to try this dish.